The Swiss pair Claudio Imhof and Silvan Dullier today at Gent won the Memorial Noël Fore, better known as the Six Day of the Future. They finished on 121 points with the Australians Carver and Law on 101 points on the same lap in second place. The British team of Jonathan Mould and Simon Yates were in third place a lap down with 66 points to complete the podium. Further evidence that I shall never understand this cycling game. After five years as a pro with Cofidis, Rabobank and for the last two years Omega Pharma-Lotto Michiel Elijzen has retired from racing to join his old team as sports director. During his short career the Dutchman took two wins. There must surely be any number of pros with fifteen years and more in the peloton who would love the chance to get in to a team car. Is five years long enough to acquire the necessary skills? What will the elder statemen in the team make of a twenty eight year old barking orders in to their ear piece? Davide Rebellin, who had to hand back his silver medal from Beijing after returning a positive dope test says he will resume competition on April 27 of next year. The Italian doper, who will by then be thirty nine, told the Spanish journal Marca about the big races he will ride again and that he even dreams of riding the Worlds! “I have two interesting offers from teams that want to give me that opportunity and in mid December I will make my choice.” Didn’t the doper take out Argentinian citizenship to try and get a ride in the Worlds when rejected by Franco Ballerini? Dream on Davide! Italian coach Paolo Bettini was yesterday in Copenhagen to check out the Worlds course. 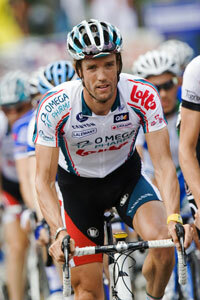 He says that it is similar to Madrid and that the only Italian who can win after 250km is Alessandro Petacchi. I am not sure he is right as in 2005 when Boonen won in Madrid the whole Italian team (and two Brits) worked for Petacchi and he still couldn’t hang on to the front group. Bettini feels that the course is ideal for Cavendish but the lack of a strong team to prepare the sprint will be a big handicap for the Manxman. My first thought is that he needs to be speaking to his HTC team mates but on reflection an international lead out train would be too obvious. I was at Lasarte in 1965 when Tom Simpson won and I have booked my flight for Copenhagen and I still think Cav can do it. I know I am far too old for this hero worship thing but who wouldn’t think that Eric Vanderaerden is the real deal? 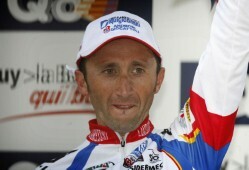 Just one more time I will mention his win in the Tour of Flanders 1985, the greatest victory in the greatest race. Another hero from the same era is Johan van der Velde of Gavia 1988 snowstorm fame. Two great riders who both failed to get the wins that their talent merited. Now their sons Michael and Ricardo are together in the Donckers Koffie-Jelly Belly team (formerly known as Qin). After serving his apprenticeship with the Rabobank development squad Ricardo van der Velde spent the last two years with Garmin where he has been largely anonimous. Michael Vanderaerden has, I believe, found a place on teams mainly because of his famous father who is the director of the new team. The team’s big name signing is Kevin Hulsmans who has been “let go” by Quick Step after eleven seasons with Patrick Lefevre as a hard working team man. Hulsmans hasn’t won a serious race since 2002 and there must be long odds on him rediscovering the winning ways he had as a junior. Perhaps the two sons will take the opportunuty to move out of their fathers’ massive shadows. I am not holding my breath. 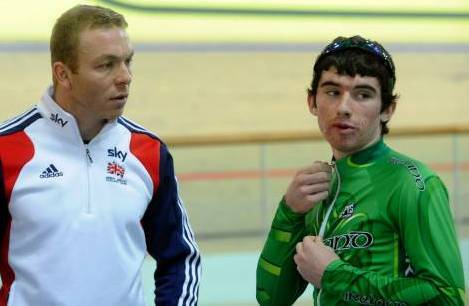 Felix English, who learnt his track craft at Preston Park Brighton, showed Sir Chris that the Irish (or should that be English) never give up no matter how hopeless the cause when he dumped the Scottish sprinter out of the European champs. This stuff gets a lot of bad press and it is true that like all sugars it has plenty of downsides. Read Dr Mirkin’s expert opininion and better yet the Doc is a bike rider. Dear Dr. Mirkin: Should I avoid high fructose corn syrup? Sixty percent of North Americans believe that high fructose corn syrup (HFCS) is more unhealthful than other sugars even though the number of calories, the amount of fructose and the sweetness is virtually the same as table sugar. They think incorrectly that HFCS-sweetened drinks cause obesity more than drinks sweetened with table sugar or fruit sugars. Table sugar is made from sugar cane or sugar beets, while HFCS is made from corn starch. HFCS is cheaper than beet or cane sugar, so it is a major source for calories for Americans today. ALL sugared drinks (including fruit juice) increase risk for diabetes, metabolic syndrome (prediabetes) and heart attacks (American Journal of Clinical Nutrition, August 13, 2010). This study shows that the more sugared drinks you take, the larger your waist circumference, and the higher your bad LDL cholesterol, triglycerides, and blood pressure. The only safe time to take sugared drinks is during or immediately after exercise. HFCS is not more harmful than any other sugared drink.